Here we have the start of something big--this Model 76 has the AIX for PS/2 operating system V1.3 loaded on it. I don't know Unix-styled systems very well, but I've learned a little from the experience of performing the installation and working with the operating system. I still have a long way to go, but what I'd like to get now is a good book on working with AIX or Unix-style systems. 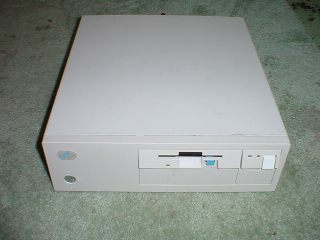 I named this computer "Kindler" because both it cooks along pretty well with AIX 1.3 on the soldered 486SX-33 CPU. Strange name? Perhaps, but I like it.